DD5LP/P – September 29th 2018 – DL/BE-094 Irschenhausen. After the attempt for a 40m contact into VK from Peissenberg failed on the Wednesday, I decided that while the weather was good I’d have another go. With the confidence that the old gear was still working well, I decided to activate Irschenhausen which I had not yet activated in 2018 yet and hence would earn me 1 more activation point. The equipment would be the same as for Peissenberg with the addition of the screw-in umbrella base as I know this summit hasn’t any convenient support posts. Luckily, the day before the activation, I checked the route to find out that the connecting road from the Autobahn to the area where I needed to be was closed and would be closed for another few weeks as it was being upgraded and re-surfaced. I worked out an alternative route which would mean a drive of about 1 hour and 15 minutes rather than just an hour, so the alarm clock was set even earlier. the plan to be to leave at 7am local at the latest in order to be on the summit at the right time for the long path to Australia (around 0630-0730 UTC). My normal “partner-in-crime” for these attempts, Mike 2E0YYY in the UK would not be able to take part as he had his stall at the UK’s National Hamfest on this weekend. I contacted John VK6NU and Ernie VK3DET both of whom kindly listen (either from their homes or portable) for these attempts and Ernie was available, so maybe there was a chance? I checked the contests calendar to see the only major contest was a RTTY contest and thought fine, they won’t affect the SSB part of the band … They did – see below! As mentioned above the normal run from my home QTH to my parking spot would normally take about an hour but with the closed road and hence a different route, I was looking at an extra 15 minutes drive. Irschenhausen summit is located above the village of the same name just off the B11 road running north-south down the eastern side of Starnberger See – one of five large lakes near Munich. 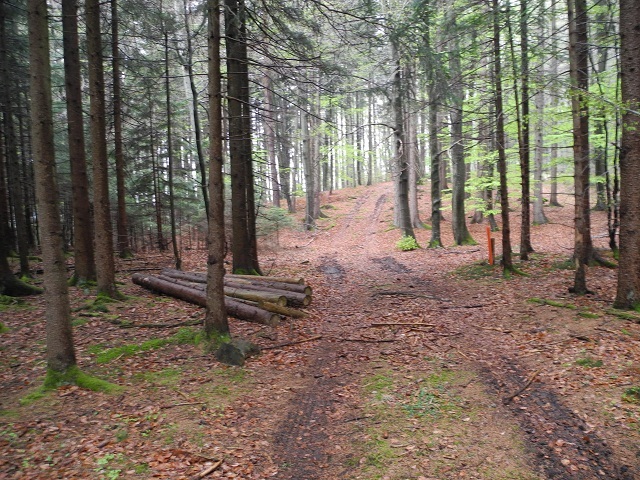 The walk from the parking spot takes about 20 minutes, first along a field track and then into the forest and keep going upwards at every junction until you find yourself at the highest spot. If you find the Trig Point stone, you’ve found the summit (see pictures). The alarm was set for 6am but I was already up by 5:45am with all the gear laid out ready to be picked up and taken. I actually was able to leave by 6:45am rather than my planned 7am. On the run to the summit apart from the last small country roads the traffic was flowing very well and after parking and walking to the summit, I was already on the air by 0600 UTC (8am local). What did I find on 40 metres? The total bottom half of 40 metres from 7.0 to 7.1MHz was full of RTTY contest stations and above 7.1 it was busy as well – as those forced off the bottom half of the band had moved up into the top half. Add to this what sounded like an Over The Horizon RADAR station warbling up and down the top half of the band and the prospects didn’t look good! After tuning around I came across a strong station and decided to call him to make sure I was getting out, despite the fact he had a pile-up going, who did he come back to? Yes me – with my 30 watts and a dipole! OK, so I was getting out fine. I searched for a free frequency, double checked it was free and then spotted myself. 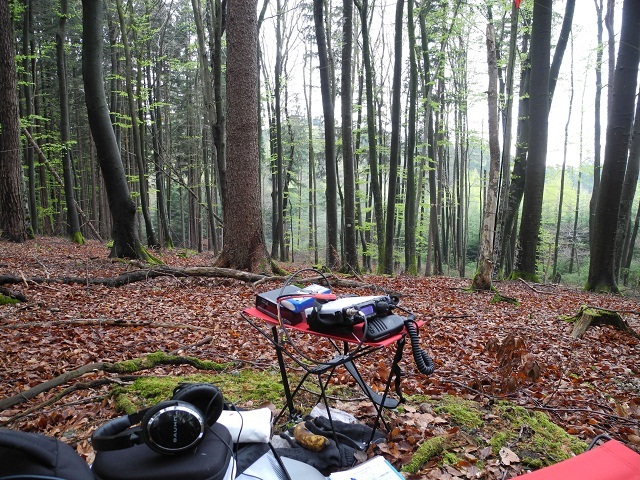 Contacts only came slowly but there was a nice one from a special event station, probably only about 10-15 km away DL100BY celebrating 100 years of the state of Bavaria (or Bayern), which was being operated at the time by a local SOTA activator Rob, DL4ROB, from Munich. I put out special calls for VK & ZL a couple of times and had to move a couple of times as my frequency was stolen by a French net. I then got an email from Ernie, saying he couldn’t hear me on my spotted frequency, so I asked him to put out a “blind call” and I COULD hear him, not strong, probably 4-2 at best but he was there! We tried for about half an hour hoping the conditions might get better but at the end we had to give up as Ernie went back down into the noise. Ernie was running 100W to a dipole at his home QTH while I was running 30W also to a dipole but out in the country on a summit and I think that was the difference. My noise level was practically zero once the OTHR left, while Ernie has Metro-noise to hear through. Had I been a CW operator, I think a contact would have been possible and any of the weak signal digital modes would have certainly got through. 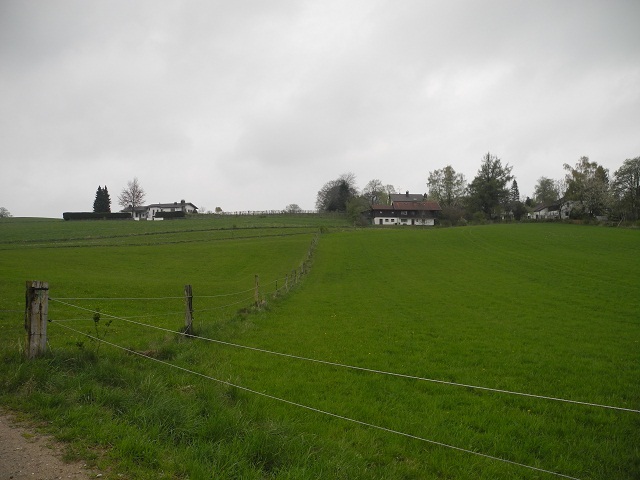 I see this as a positive experiment – the path (on 40 metres) is there with the long path as it is when 20 metres works – which at the moment with a MUF of 8.6MHz, an SFI of 66 and a K Index of 3 – it isn’t! After this experiment with Ernie I went back to “normal” SOTA contacts and dropped another five into the log making a total of thirteen valid contacts for the day. On my way walking back to where I had parked my car a small tractor with the farmer and his very young son came past me and I said good morning to them. As I was driving off, I could see the farmer waving to me, so I stopped and walked back, expecting perhaps a comment that I shouldn’t be there but it was completely the opposite. He was interested in what I was carrying and as I explained Amateur Radio to him (and gave him a German DARC brochure) he seemed genuinely interested and we chatted for about 15 minutes before grandad came by to say there was farm work to be done! That was a nice end to the activation. If he’s around next time I activate this summit, I’ll invite him up to see for himself. Who knows this could be a new radio ham in the making! The drive back hit the Saturday morning traffic on the Autobahn and so took a little longer but I was back before 11 am (local) which was as I had planned. All in all a nice activation. Modified QAMP amplifier (30W on 40m). Although I did not achieve a two-way contact with VK, the fact that I could hear Ernie proves the path is there, perhaps a little more power from my side, a higher antenna – or it set up in a better direction, might just make the difference. Running FT-8 would work, I’m sure. A few more sunspots would certainly help! DD5LP/P – August 30th. 2017 – DL/BE-094 Irschenhausen. Mike 2E0YYY contacted me suggesting that we might try for some long path contacts into VK/ZL as conditions had improved a little from the horrible state they had been in for the last couple of months. This would mean me chosing a summit that I could get to by 8am local time, which rules out several nice summits as they need the cable car lift to get to them and they don’t start running until 9am or later. I looked at the summits that would be accessible and realised that I hadn’t activated Irschenhausen for the last two years and I had made a contact into VK from there. So Irschenhausen it would be. I would use the usual kit – the FT817, my small modified Ramsey amplifier to take that up to 20 or 25 watts, feeding the SOTABeams Band hopper linked dipole on a 5 metre pole. I would also take my screw-in base as well, as I have found that it’s easier to carry that than look for a suitable post or small tree. I have moved my home QTH since my original activation of this summit, so the drive to my parking spot has increased to nearly an hour. Irschenhausen is located above the village of the same name just off the B11 road running north-south down the Eastern side of Starnberger Sea – one of five large lakes near Munich. The walk from the parking spot takes about 40 minutes, first along a field track and then into the forest and keep going upwards at every junction until you find yourself at the highest spot. The alarm was set for 5:45am and all the gear laid out ready to be picked up and taken. I actually woke at 5:30 am and was able to leave by 6:30am rather than my planned 7am, which worked out well as I missed most of the heavy traffic en-route. The weather forecast was for a dry morning, but rain to appear in the afternoon, however as I planned to be back home by 11am, this didn’t concern me. On getting to the turn off from the B11 to Irschenhausen, I saw half the road was blocked off with a barrier and a sign saying that access was only possible up to the restaurant in the village – not knowing where that was, I decided to try in any case but as I got into the village, my next turn-off was also half closed with a sign that said access only possible up to the road works and no further. Again not knowing how far up the road the road works were, I decided to try anyway – it might just mean some more walking. As it turned out, despite a trough cut all the way up the road, that had been recently filled in (but not fully up to the road level), I managed to get all the way to my parking spot. I had been lucky. Once I got the gear out of the car, I started my walk, which seemed longer than I remembered but indeed it did take just over 20 minutes to walk to the summit. As I set off I saw a wind turbine that hadn’t been there at my last visit and I hoped it wasn’t on the summit – in fact it turned out to be much further away and caused me no issues at all. This summit has a forest all over it – which I believe may account for some of the problems that I was later to have on the bands. In any case, on arrival at the summit I screwed the sun umbrella base into the ground and dropped my 6m fibreglass mast into it. After running the dipole out and setting up that station on the ground on my faithful painter’s thick plastic sheet, I started by listening around 20 metres. It was very quiet and it was hard to find more than one or two stations on. To add to the problem the local cell phone networks were playing up meaning that getting a self spot out was very hit and miss. It seems that although Vodaphone indicates a 4G Internet data link from this summit, it doesn’t always work and Telekom’s 3G link often dropped to “edge” (slow) speeds. To start with there were a lot of late season mosquitos – most of which I flattened before they could bite me, but I did go away with a few “souvenir” bites. I was surprised to find these so late in summer and so far away from water but I guess the forest creates a damp climate for them. As the main reason for the activation was to try for a long path contact into VK or ZL I continued trying on 20m and just by tuning around found a couple of interesting contacts. One contact was with Jesus, EA9ACF in Ceuta, the Spanish enclave in Northern Africa. He was booming in. After a while my self spots got out and I managed contacts with a few of the usual chasers but QSB was a real problem. Later I heard a Japanese station JA8COE, Tako at a true S9 and then what appeared to be an Italy – Australia net where a station in NSW and one in Queensland, Australia were getting through at about 5-5 or 5-6. I had no chance of getting into the net or through Tako’s pile-up but the path was definitely open. I also listened for some other SOTA activations in Europe that had been spotted without success but thanks to perseverance from Christos and Stavros (SV2OXS and SV2RUJ), I managed an S2S with SV/MC-089. Once I decided 20 metres wasn’t improving and while I had alerted, I would operate on 40 metres as well as 20m, I decided to take down the antenna, adjust the links and switch the 817 and amplifier and try 40 metres. It was like chalk and cheese. The band was full! Finding a free frequency was difficult and after one SOTA QSO would normally become unusable from the splatter of other stations, so I was constantly moving and re-spotting (when the spotting worked). After a while I decided that time was short as we were to visit friends in the afternoon and I had to first get home and ready for the second trip of the day. Pack-up and return to where the car was parked and no sign of road work blocking my exit, so it was back home before the traffic got worse later in the day. Whilst band conditions were difficult on 20 metres the trip out was worth it as the fact that I heard a Japanese and two Australian (presumably super) stations, does mean band conditions are getting better. I suspect the trees on this forested summit may have been part of the reason that I did not get out very well. The use of a vertical antenna may have been better for DX but it would have suffered even more from the tree landscape. For just one point, there has to be a reason to come to this summit (for me it was the activation time) there are several just as easy to get to later in the day better summits. As my German call sign came through, this activation was done as DD5LP/P. This was the first time I had used my new call sign. The plan for this activation was again to work chasers from VK and if possible also work Rod VK2LAX/P as a Summit-to-Summit contact. Martin DF3MC had asked if he could come along as he had not yet managed an S2S to VK. Unfortunately as it turned out he could not make Easter Sunday, so perhaps I’ll have to find another summit in the next few weeks and do it all again (not that I needed an excuse for that). Actual Wx – no rain, sunshine but still only 2 degrees at 7:30am local time Brrrrrr! 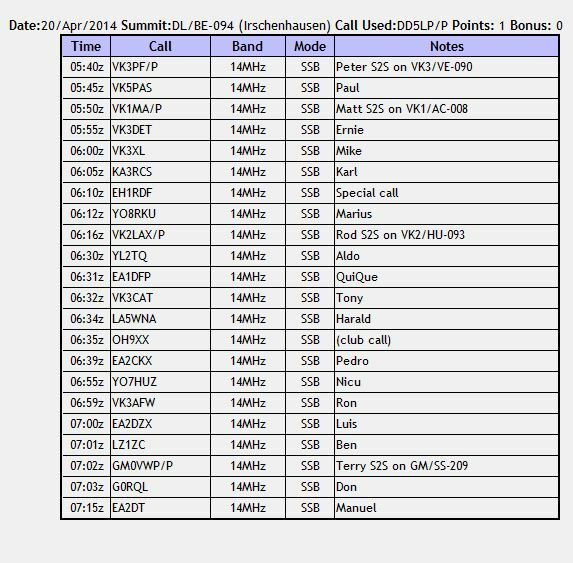 Summit activated (first 4 contacts) completely with VK calls (2 of these S2S). 4 x S2S (3 VK and 1 GM). 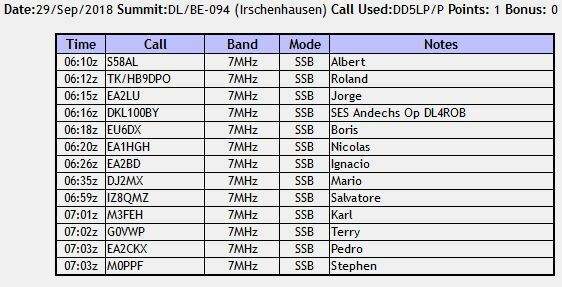 22 contacts in all from VK1,2,3&5, KA3, EH1, YO7&8, YL2, EA1&2, LA, OH, LZ1, GM and G.
Irschenhausen is a country village located about 10 km South East of Starnberg which itself is located about 20km South West of Munich in Bavaria. 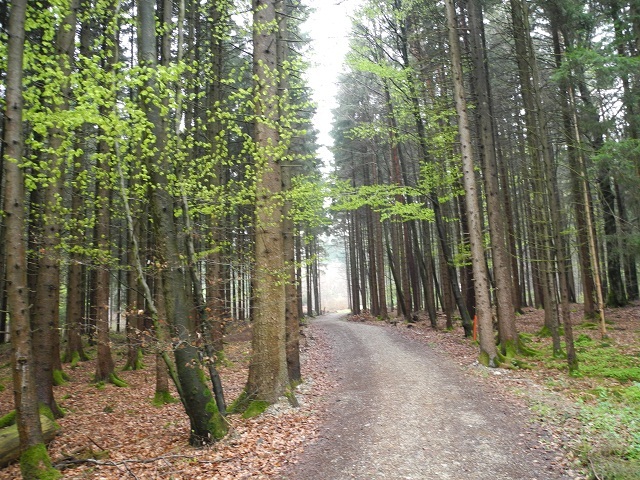 The “summit” is actually a hill within a forest adjacent to the village. 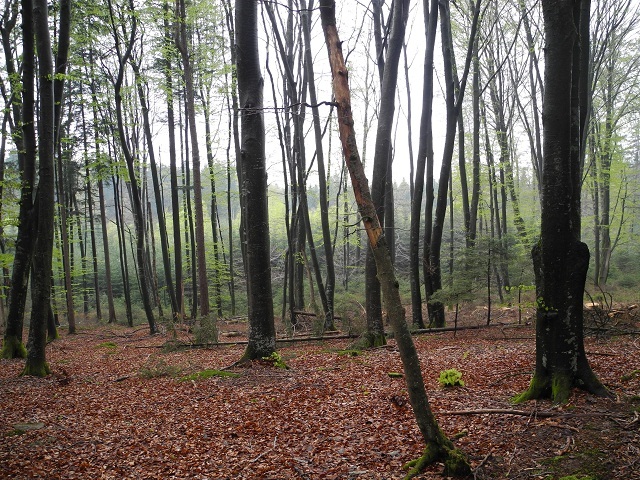 In some ways similar to my previous activation (Berndorfer Buchet) which was also in a forest, views are limited. I found during my “reccie” a day earlier however in this case there were small trees still in place suitable to fasten the antenna squid pole to. Access from the public road is about a 15 minute brisk walk up reasonable tracks. No actual climbing was required however the summit itself was under about 3 inches of fallen leaves. 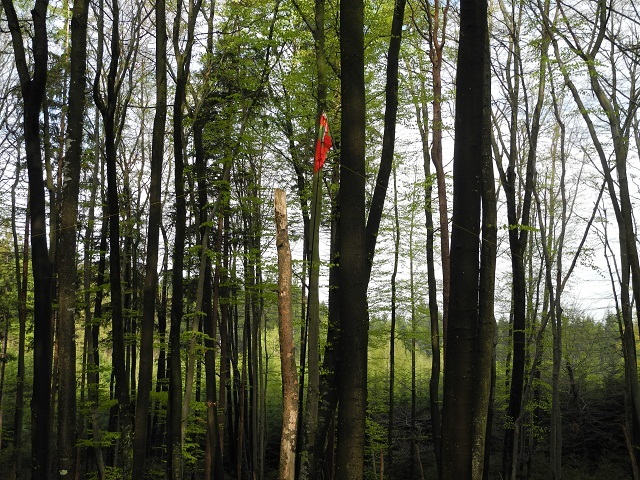 Luckily I found a very broad tree stump to set up my station on and had the antenna (proudly flying the SOTA flag) attached to a small tree about 3 metres away. I had measured the time required to get to site however as I woke up earlier and there was less traffic than the previous day, I arrived a good 30 minutes earlier than the planned UTC 06:00 start. I took a little extra time to install my small linear amplifier in circuit as a test and I estimate that this raised the output from 5w PEP to perhaps 10w PEP. I had to run it straight from an 11v LIPO rather than from the 13.8v inverter that for some reason didn’t seem to want to work, so output from it’s, at best 14w output would be reduced. As soon as I had the linked dipole antenna up and the FT817 and amplifier turned on, I could hear VK stations. Paul VK5PAS was blasting in while working Peter VK3PF, so I waited and gave Peter a call. He was pretty weak but we managed the S2S contact. After that an easy contact with Paul VK5PAS, followed by Matt VK1MA who also was putting in a strong signal from Mount Ginini and the forth contact needed for me to have officially activated the summit came from Ernie VK3DET. So I managed to activate this German summit purely with VK contacts – this was not planned but was a nice bonus especially with two of them being S2S contacts. I am also glad to report that we managed the DD5LP – VK2LAX S-2-S contact. During the activation I was constantly changing frequencies, not only to find stations but also to move away from QRM from either adjacent stations or a station who decided to put a carrier on the frequency I am calling on! Take a listen to the pile-up that Matt VK1MA had in the video below and see how badly some operators were operating. Please consider adopting the DX Code of conduct whether you are a SOTA activator or chaser as the rules are as valid for SOTA as for DX chasing. In conclusion though the activation was very successful and as always an activation is only successful when there are chasers there looking out for you!